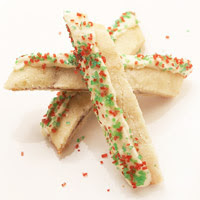 Kids love these fun-to-eat raspberry and apricot cookie sticks. Preheat oven to 375 degrees F. In large mixing bowl beat butter and 1/2 cup shortening 30 seconds. Add sugar, vanilla, and 1/2 teaspoon salt; beat until combined. Beat in as much flour as you can; stir in any remaining flour. Knead dough together; shape into ball. For filling, combine preserves, apricots, and peel; set aside. Divide dough in half. Roll each half between waxed paper to 612 inches; remove top paper. Spread filling lengthwise on half of each rectangle to within 1/2 inch of edges. Fold dough over filling; seal edges. Use paper to invert onto greased cookie sheet. Reseal edges with fork tines. Bake 20 to 25 minutes or until browned. Cool on cookie sheet on rack. Transfer to board; cut in 3/4-inch-wide sticks. Return to cookie sheet. Bake 8 to 10 minutes more or until crisp. Cool on rack. In microwave melt baking pieces and 2 tablespoons shortening 1-1/2 to 2 minutes; stir twice. Dip cookies in mixture then sugar. Cool on waxed paper. Makes 30 cookies. Store: in airtight container in layers separated by waxed paper at room temperature 3 days. Freeze 3 months. Nutrition facts are given per cookie. Calories 262, Total Fat 14 g, Saturated Fat 8 g, Monounsaturated Fat 4 g, Polyunsaturated Fat 1 g, Cholesterol 16 mg, Sodium 101 mg, Carbohydrate 32 g, Total Sugar 19 g, Fiber 1 g, Protein 0 g. Daily Values: Vitamin C 0%, Calcium 0%, Iron 0%. This entry was posted on 6:19 PM and is filed under Desserts . You can follow any responses to this entry through the RSS 2.0 feed. You can leave a response, or trackback from your own site.